Welcome to Seattle, Washington where the land is lush, the people are active and the food is healthful. 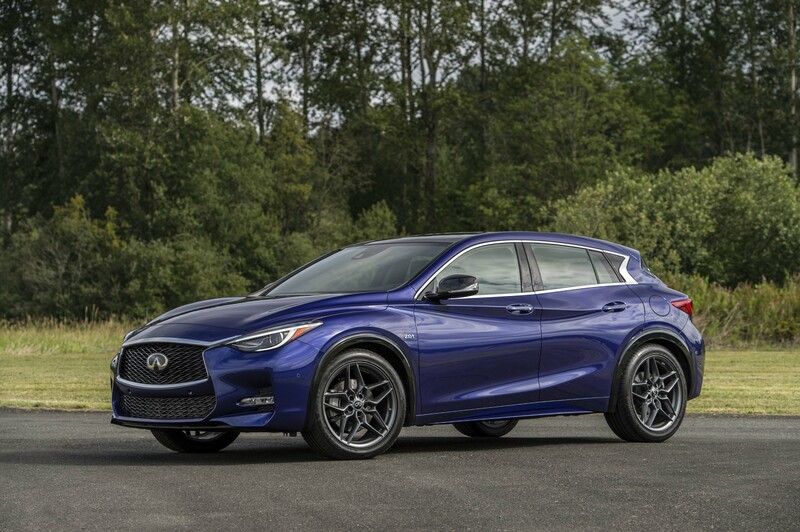 It was an ideal setting for Infiniti to introduce their new 5-door, entry-level utility vehicle dubbed the QX30 to compete in the C-segment crossover market. Slated for continuous and tremendous growth, this sector presents an opportune time for the Japanese automaker to access and gain ground. First conceptualized as the Etherea Concept, the 2017 Infiniti QX30 is the manifestation of the Renault-Nissan alliance and Daimler AG partnership created in 2011 to jointly share componentry, engines and factories. This model in particular is built at the Nissan plant in Sunderland, England and represents the second plant outside of Japan that manufactures Infiniti vehicles. For instance, the QX30 is reminiscent of the Mercedes-Benz GLA. Experiencing the QX30 was fun and engaging. After running 3.5-miles along the Seattle Waterfront and simultaneously taking note of the plethora of bicycles roaming around town, it is simple understanding why Infiniti has planned the vehicle for young families looking for more than a sedan but also clamor utility and compact, sporty performance. These customers may be new to the brand but they certainly won’t be disappointed. If a larger crossover is desired than the QX50 is next in line. The rookie QX30 represents the 8th Infiniti model and the 5th utility on the roster which ends with the homerun slugging QX80. With a lot of pep in its step, the FWD QX30 is powered by a 2-liter turbocharged 4-cylinder engine co-shared with Daimler. Through 208-horsepower and 258 lbs-ft of torque between 1,200 and 4,000 rpm the vehicle had no problem accelerating in traffic or up hillside Washington roads. It was actually pleasurable, partly due to the pairing of a 7-speed dual-clutch automatic transmission with paddle shifters and three drive modes (Economy, Sport and Manual). The steering wheel is thick how I like it and features embedded thumb indentations for sporty performance. Infiniti optimized the compliant electric power-steering and tuned the transmission for city stop-and-go traffic. Manual mode was my choice and allowed control of the gears precisely how I needed them. The QX30 also represents the first vehicle to offer Infiniti Stop-Start for better fuel economy. However, I’m not a fan of the engine shutting down at lights. There are three unique models with specified characteristic traits for active lifestyle consumers to choose from. 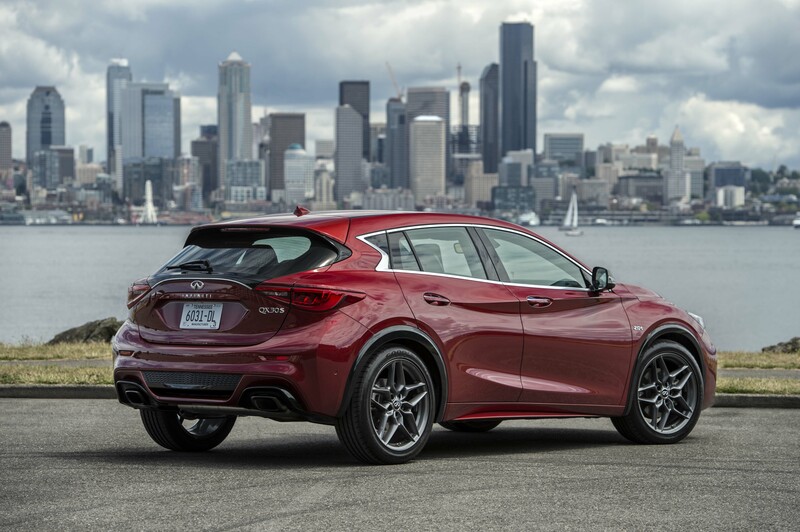 The QX30 starts at $29, 950 and leaves training camp with a 6.7” ride height, 18” alloy wheels with all-season tires (19s optional), a Rear View Monitor and LED running lights. It can be had as a Base, Luxury or Premium trim. My favorite, the QX30 AWD kicks off at $34,400 with 18” Continental all-season tires, front and rear skid plates, roof rails, a 1.2” higher ride height and rugged side sills and overfenders. The AWD aka Infiniti Intelligent All-Wheel Drive is FWD biased and comes as either a Premium or Luxury iteration. The QX30 Sport commencing at $38,500 (roughly $42,000 as tested) is built in one grade with exclusive 19” alloy rims, Goodyear 235/45 R19 summer run-flat tires, dual dark chrome exhaust tips, .6” lower ride height, sport seats (pretty narrow for my build) and a flat-bottom steering wheel with aluminum pedals. With various mannerisms of each model Infiniti made certain to tune the rides so collectively their steering and suspension setups match up. More importantly I didn’t notice any FWD torque steer during my daylong assessment through the busy downtown city streets, along the outskirts of the Hood Canal shoreline in Union nor at any of the immaculate Washington islands. The all-new 2017 QX30, which was created for a new generation of premium buyers who appreciate category-defying design inside and out, boasts a purposeful appearance that makes a bold visual statement as part of Infiniti’s premium model line-up. Despite the deeply sculpted body lines and curvilinear silhouette, double-arch grille, signature daytime running lights, nine exterior hues, tailgate spoiler and LED signature lamps, much emphasis was put into the QX30’s interior. For example, the Spinal Support Seats focus on neutral body posture and evenly distributes forces on the lower back by reducing the downward pressure on the pelvis and torso. Infiniti InTouch 7” infotainment is the center of the vehicle’s attention and operates navigation, music options, apps and much more. Though, it will take some time to become acquainted with the system. An array of packages and options will help define your QX30 as well as increase total sales price. A Bose 10-speaker surround system is always a positive plus and the available panoramic moonroof, Nappa leather and true genuine wood elevates the little guy’s stature. The rear seating is more for children than adults so keep that in mind when carpooling. Of course Infiniti has always been a progressive, forward thinker when it comes to automotive safety and intelligent engineering. Specific technologies to name a few include Intelligent Cruise Control, Lane Departure Warning, Forward Emergency Braking, High Beam Assist, Intelligent Park Assist and Around View Monitor with a 360-degree view from four cameras (one on each side mirror, one in front and one in the rear). “The all-new QX30 is an exciting addition to the line-up for 2017, expanding the Infiniti brand to a wider range of customers,” said Randy Parker, vice president, Infiniti Americas. “It offers truly standout styling, a level of refinement usually reserved for more expensive luxury segments and the agile, exhilarating dynamic performance that has been an Infiniti trademark for more than 25 years.” We shall see how the trio of QX30s fare in the marketplace. With room for expansion in the C-segment they have a pretty good chance of fitting in just fine.